Captain Typho is Senator Padme Amidala's head of security and personal bodyguard. This loyal and determined leader courageously defends Padme from all who threaten her life. 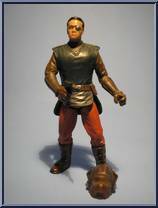 Contribute pictures, update details or suggest corrections for Captain Typho (Padme's Head of Security). Write a review about Captain Typho (Padme's Head of Security).